Source: After IFPI Recording Industry in Numbers 2012. In 2011, 83 percent of all markets were dominated by physical sales (CD, DVD, vinyl) with a market share of more than 50 percent. 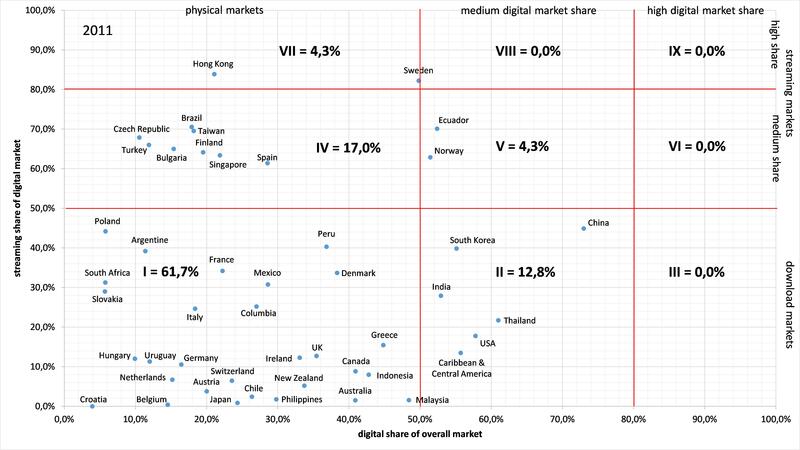 In particular the GSA market countries had a digital market share below 25 percent. In Japan, France, Italy, Brazil and in the Netherlands CD sales were the most important revenue source for the recorded music companies too. 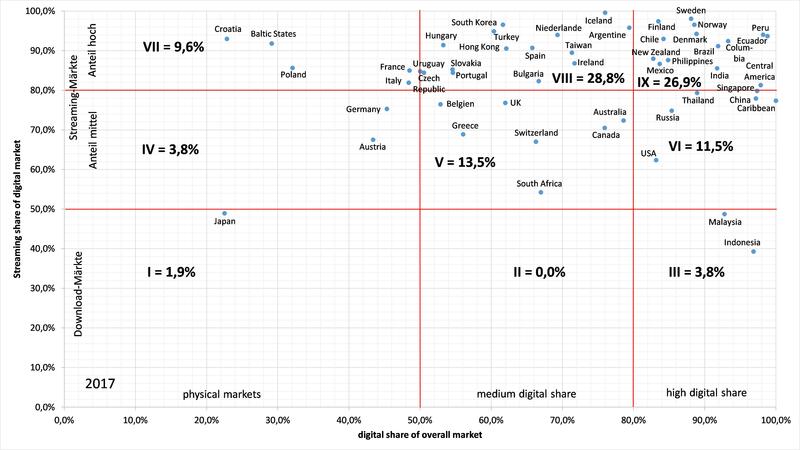 In the UK; Australia, Canada, Denmark and Ireland the digital music market was already established with a share of more than 30 percent, but physical sales were still dominant. Just in a few countries/regions – China, Ecuador, India, Caribbean & Central America (excl. Mexico), Norway, South Korea, Thailand and the USA – digital accounted for more than 50 percent of the overall revenue in 2011. However, music streaming was not relevant in most of the digitized music markets. Thus, in the US, South Korea and China album and single track downloads were the most relevant revenue sources. 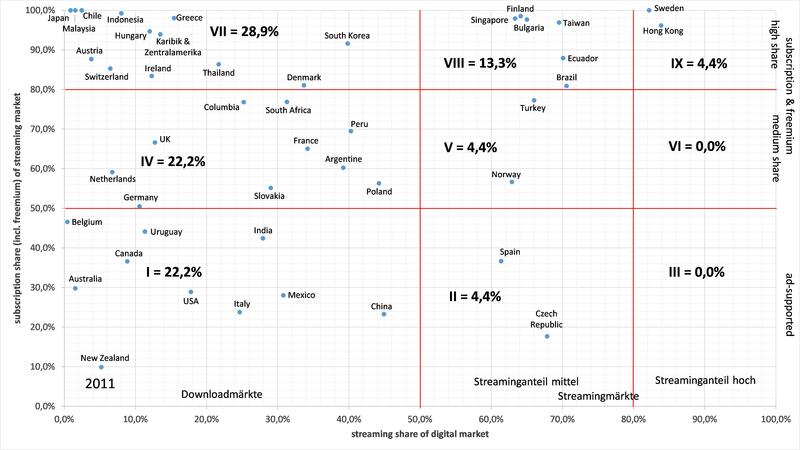 Just in three countries – Sweden, Norway and Ecuador – a relevant streaming segment had evolved with a digital music market share of more than 50 percent. In other countries music streaming was also the most important digital revenue source, but with strong physical sales and a market share of 50+ such as in Brazil, Bulgaria, Czech Republic, Finland, Singapore, Taiwan and Turkey. Hong Kong had a special position in 2011 with an 83.9 percent streaming share of the digital market which was even higher than in the music streaming pioneering country Sweden. Source: After IFPI Recording Industry in Numbers 2015. While in 2011 just Sweden and Hong Kong had well-developed music streaming markets, three years later seven countries joined this club: Finland, Norway, Sweden, China, South Korea, Taiwan and Croatia. In Sweden, Norway and China the download was not important at all, since all three countries directly transformed from physical to streaming markets. The situation in Finland with an 87.4 percent streaming share of the digital music market was similar, but Finland had a still relevant CD market in 2014. In Croatia, no music streaming revenue was reported in 2011, but three years later streaming was the most important digital revenue source (digital market share of 91.3 percent). However, physical sales still accounted for more than 75 percent of the overall revenue in Croatia in 2014. In contrast, South Korea was a more or less digitized market in 2011 due to highly relevant download sales of more than 60 percent digital market share. Three years later downloads had become irrelevant with music streaming dominating the market (91.9 percent digital market share). However, most of the countries had relevant physical sales in 2014. We, therefore, have to distinguish digital music markets with a streaming share of more than 50 percent such as Spain, the Netherlands, France, Italy and Brazil and markets with a still relevant download segment such as Japan, South Africa, Germany, Austria and Switzerland. The world largest phonographic market – the US – was highly digitized in 2014 due to download sales, whereas streaming revenue was comparably modest. This was also the case in the UK, Australia, Canada and Russia. In Mexico, India, Singapore and Thailand download sales were relevant too despite a streaming share of the digital market beyond 50 percent. In 2017, the overall picture was totally different from 2014. Nearly 85 percent of all countries in the sample were digitized (digital market share of more than 50 percent) due to a well-developed music streaming market with a digital market share of more than 80 percent such as Scandinavia (Denmark, Finland, Norway and Sweden) and Latin America (Brazil, Chile, Columbia, Ecuador, Mexico and the Central American countries). In Asia India, the Philippines and Singapore had highly relevant music streaming markets as well as China and Thailand with a streaming market share of about 80 percent and more. Whereas in Malaysia and Indonesia digital music revenue was still dominated by music download sales. The US had a special position with a streaming market share of more than 60 percent, but with considerably high download sales. Whereas physical sales were not relevant anymore with an overall market share of less than 20 percent in the US in 2017. In further countries – especially in Europe and Asia – streaming was the most important digital revenue source, but with a still important physical music market of 20 to 50 percent market share such as in Bulgaria, Czech Republic, Hungary, Ireland, the Netherlands, Portugal, Slovakia, Spain and Turkey as well as in Hong Kong, South Korea and Taiwan. A smaller group of countries had digitized markets (market share of more than 50 percent), which were dominated by music streaming but with a relevant download segment such as Australia, Belgium, Canada, Greece, South Africa, Switzerland and the UK. In a few countries physicals sales were economically relevant despite a high music streaming market share such as in the Baltic States (Estonia, Latvia and Lithuania), Croatia, France, Italy and Poland. Austria and Germany had a medium streaming market share in the digital segment and still considerably high physical sales. And Japan had the largest physical market worldwide with a 75 percent market share of the physical product along with comparably low music streaming revenues that account for less than 50 percent of the digital music sales. It can be summarized that all countries are on the way to music streaming economies, but in very different stages of the development. 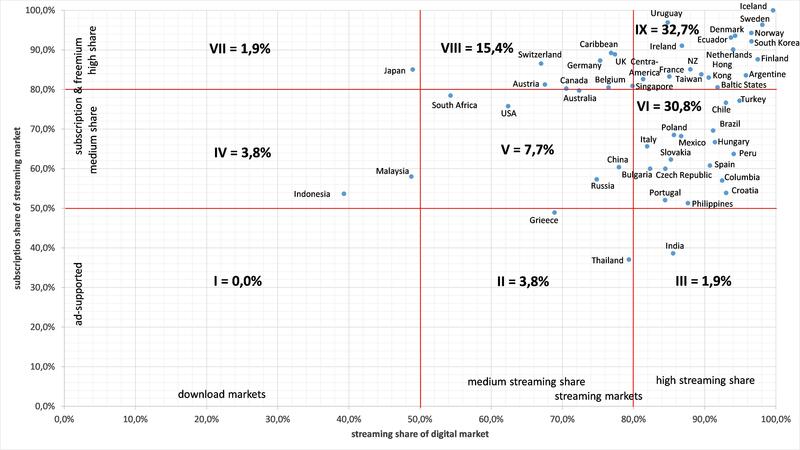 Whereas more than a quarter of all countries – especially in Scandinavia – had pure music streaming markets, other countries either had a relevant physical market segment (Canada, Switzerland, UK) or download segment (Indonesia, Malaysia and the US). Finally there are a few countries with a still important physical market such as Austria, Germany and Japan. 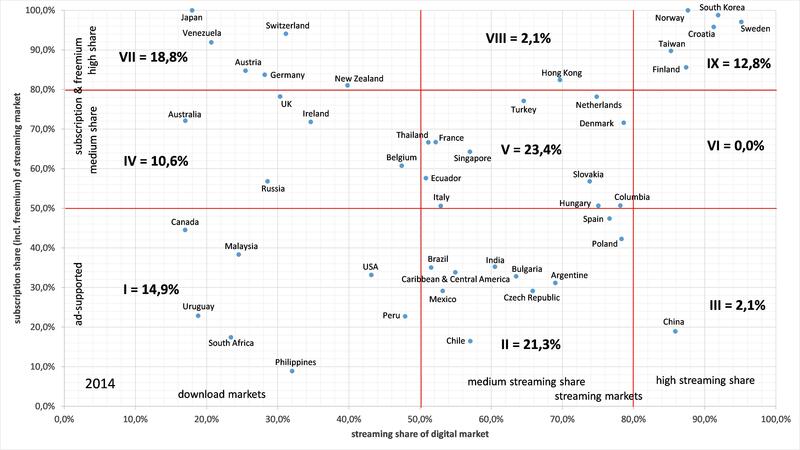 The analysis also highlights that the streaming markets differ among countries. However, we have to consider that the IFPI revised the statistics for music streaming in 2016. In the years prior to 2016, IFPI included paid subscriptions as well as the freemium streams income from Spotify & Co. in the category “subscription streams” and all revenue from audio or video streams monetised solely by ad-supported models in the category “ad-supported streams”. In 2016, IFPI introduced three different streaming categories: (1) “subscription audio streams” which includes revenue from paid subscription services and premium tiers of services such as Spotify and Deezer; (2) “ad-supported audio streams” which includes income from free tier of audio subscription services such as Spotify and Deezer and (3) “video streams income” which includes revenue from video streams monetised by advertising or subscription models such as YouTube, YouTube Red and VEVO. Therefore, the streaming categories introduced in 2016 do not correspond exactly to either of the two categories used in 2015 and in the years before. Nevertheless, a year-to-year comparison of 2011, 2014 and 2017 highlights a change of music streaming consumption behaviour in the different territories from ad-supported music streaming to subscription streams. countries dominated by music downloads and with a subscription share of the streaming market from 20 to 50 percent such as France, Germany, the Netherlands and the UK. countries with a strong download market and a dominance of ad-supported music streaming (streaming market share of more than 50 percent) such as Australia, Canada, China, India, Italy and the US. In 2014 the picture was very different than three years before. 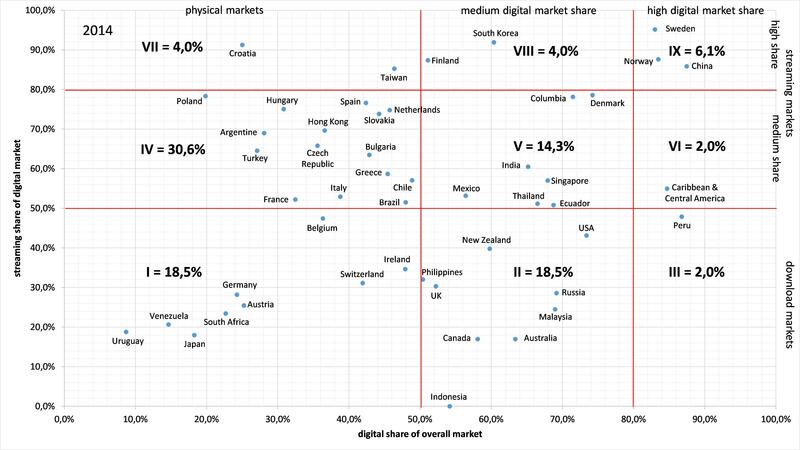 Just 38 percent of all countries had a strong download market with a digital market share of more than 50 percent. The subscription model already dominated the streaming market in Austria, Germany, Japan, New Zealand, Switzerland and Venezuela. In Australia, Belgium, Ireland, Russia and in the UK. Ad-supported streaming was still relevant with a music streaming market share of 20 to 50 percent. Whereas in Canada, the US and further five countries ad-supported streaming was the main streaming income source. More than 60 percent of the countries in the IFPI report had a medium music streaming market share with a still relevant download segment. There were two different types of streaming markets: (1) countries with a dominant ad-supported segment such as India and several Latin American countries (Argentine, Brazil, Chile, Caribbean States and Mexico) as well as Poland, Spain and the Czech Republic; (2) countries with a dominant subscription (incl. freemium) segment such as Denmark, France, Hungary, Italy, the Netherlands, Singapore, Slovakia and Turkey. Six countries were already music streaming economies in 2014: Sweden, Norway, Finland, South Korea, Taiwan and Croatia, which had a still highly relevant physical market. Hong Kong, however, dropped out of streaming economy segment in 2014, since downloads had become more relevant than three years before. China as a well-developed streaming economy had a special position in 2014 with a strong ad-supported streaming segment. Three years later the international streaming markets had fundamentally changed again. Despite the new IFPI categorization by adding freemium revenues to “ad-supported audio streams”, the subscription model was on the rise. In 2017, two third of all countries were music streaming economies dominated by revenues from subscription services. Just in Greece, India and Thailand ad-supported streaming was more important than subscription streams. A third of the markets had a streaming market share as well as subscription share of more than 80 percent as in Scandinavia, Baltic States, France, Ireland, the Netherlands but also in Hong Kong, New Zealand, South Korea and Taiwan as well as in most of the Latin American countries. However, in streaming economies such as Brazil, Chile, Italy, Portugal, Spain and Turkey, the revenue from ad-supported music streaming was still relevant. A special case is Croatia with still relevant physical sales, and a shift from subscription to ad-supported streams which can be explained by IFPI’s new categorization of streaming revenues in 2016. Another exemptions are the US, China and Russia. In all three countries download sales were still relevant in 2017 with a digital market share of 50 to 80 percent and ad-supported streaming was more relevant than subscription. Therefore, just three countries – Indonesia, Japan and Malaysia – were not fully developed streaming economies in 2017, since the download market was still highly relevant (digital market share of more the 50 percent). In further fourteen countries (e.g. Austria, Canada, Germany, Switzerland and the UK) the download was also relevant, but with music streaming as main income source in the digital music market. The comparative analysis, therefore, highlights a different development of music streaming markets from 2011 to 2017. There is a clear trend towards a music streaming economy with subscription services in the core, but there are still countries with relevant ad-supported music streaming segments, download markets and even physical markets. Therefore, a single and uniform business strategy for music streaming is not the answer to the emergence of an international music streaming economy. Music streaming has boomed in the past few years and most of countries included in the IFPI reports have turned into music streaming economies. Nevertheless, some countries had a still relevant physical market (e.g. Austria, Germany and especially Japan) or download market (e.g. Indonesia, Malaysia, South Korea and the US). Thus, different types of streaming economies exist side by side which can be explained by peculiarities in different countries. In a following series of blog posts detailed analyses for several countries/regions will be delivered. International Federation of the Phonographic Industry (IFPI), 2012, Recording Industry in Numbers. The Recorded Music Market 2011. London: IFPI. International Federation of the Phonographic Industry (IFPI), 2015, Recording Industry in Numbers. The Recorded Music Market 2014. London: IFPI. International Federation of the Phonographic Industry (IFPI), 2018, Global Music Report 2018. London: IFPI. Please note that a lot of countries outside Central and Western Europe as well as Northern America have a high piracy share and therefore pirated sales are not included in the official statistics. GSA stands for Germany, Switzerland and Austria. See for a detailed explanation in IFPI’s Global Music Report 2018 (p. 131).